Settled in the Champagne region for over 4 centuries, the ROUALET family has stayed clustered around Champillon with 3 successive generations of winegrowers. The family name derives from the word ROUALE which means a small pick used to plant vines. 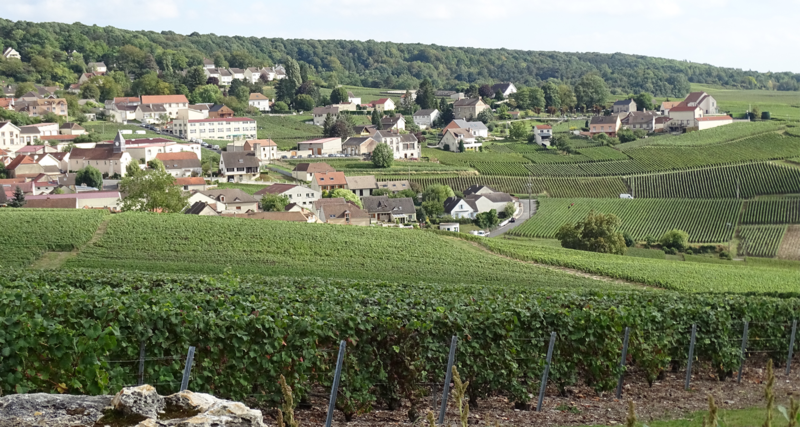 The House of Roualet has its own vineyard, and most of its vines are grown in the Marne valley between Champillon and Dizy. The three Champagne grape varieties – Pinot Noir, Pinot Meunier and Chardonnay - are grown on chalky soil with the sunny exposure needed for the grapes to ripen properly. After harvesting, the grapes are pressed to give grape must which ferments in stainless steel vats for two to three weeks producing clear, still wine. The different vats containing different growths and grape varieties are blended to create our various cuvees. During the bottling process, sugars and yeasts are added to the blended still wines to create a second fermentation – the formation of bubbles –giving the champagne its effervescence. The bottles are hermetically sealed with stainless steel capsules and stored in our cellars for several years. The ageing process gives the wine its character and varies depending on the batch. During the formation of bubbles, the yeasts form a deposit in the bottle. Riddling on racks for several weeks concentrates this deposit in the neck of the bottle on the capsule. The neck of the bottle is then plunged into a cooling bath to trap the deposit in ice. This is expelled when the bottle is opened in the process known as disgorging. A variable dose of liqueur d'expédition is added depending on the cuvees before sealing the bottle with a cork and wire-cap.